Alcee Hastings was born on September 5, 1936 in Altamonte Springs, Forida. He earned a BS degree in zoology and botany from Fisk University in 1958, and a JD from Florida A&M University in 1963. From 1963-79 he worked as an attorney. President Jimmy Carter appointed Hastings as a judge for the Southern District of Florida in 1979. But two years later Hastings found himself embroiled in a corruption scandal, indicted on charges of conspiracy to accept a bribe. Despite overwhelming evidence of his guilt, Hastings was acquitted by a jury in 1983 because his alleged accomplice refused to testify (and was incarcerated as a result). Hastings, meanwhile, claimed that the charges against him were racially motivated. Not long after Hastings’ acquittal, however, three federal judges took the unusual step of calling on the House of Representatives to impeach him on the criminal charges. A report compiled by a special Investigating Committee in 1986 found clear evidence that Hastings had covered up his role in the bribery scheme. In 1987 a panel of 27 federal judges recommended impeachment. The following year, the Democrat-led House of Representatives voted 413-to-3 to impeach Hastings on 17 counts including bribery and perjury. And in 1989 a Democrat-controlled Senate convicted Hastings and removed him from his judgeship, making him only the sixth federal judge to be impeached and removed from office in U.S. history. In 1990 Hastings, a Democrat, ran unsuccessfully for the office of Florida Secretary of State. Also in 1992, Hastings was elected to represent the overwhelmingly Democratic, mostly black, newly-created 23rd Congressional District of Florida. “I bring with me the added notoriety of being impeached and removed by the same body that I now get to serve in,” Hastings boasted at the time. In January 1993, just before Hastings was sworn in as a congressman, the Supreme Court ruled that courts had no authority to review Senate impeachment trials — thereby effectively upholding Hastings’ impeachment. Hastings has been reelected to his House seat every two years since 1992, though in 2012 his District was reconfigured and renumbered as the 20th. His campaigns have been endorsed by the Democratic Socialists of America (DSA), and he is a member of the Congressional Black Caucus. In 1995 Hastings supported the “Living Wage, Jobs for All Act” introduced by Rep. Ron Dellums, a DSA member. Other supporters of this legislation included John Conyers, Lane Evans, Bob Filner, Maurice Hinchey, Jim McDermott, Cynthia McKinney, Eleanor Holmes Norton, Major Owens, Nancy Pelosi, Bernie Sanders, and Nydia Velazquez. In 2004 Hastings was the subject of three separate ethics investigations by the House Committee on Standards of Official Conduct, the Florida Elections Commission, and the Federal Election Commission. Also in 2004, Hastings was elected to a two-year term as Parliamentary Assembly president of the Organization for Security and Co-Operation in Europe (OSCE), an international body that monitors elections in developing democracies. PoliticalMoneyLine, a watchdog group that tracks money in national politics, pointed out in 2004 that Hastings ranked second (after Rep. Douglas Bereuter of Nebraska) among American lawmakers in the number of taxpayer-funded trips he had taken during the preceding ten years. All told, Hastings had taken 57 trips to 116 countries—at a price tag of over $152,000, not including costs for staff or the use of military aircraft. Many of those trips were made on behalf of the OSCE. In the early to mid-2000s, Hastings denounced the U.S. War in Iraq as “unjustified.” He also accused the Bush administration of having engaged in the “pre-meditated fabrication of intelligence” so as to create a pretext for military action. In addition, Hastings cast votes against the Patriot Act and against the warrantless domestic surveillance of American citizens with suspected terrorism ties. In May 2009, the Wall Street Journal reported that Hastings in 2008 had spent $24,730 in taxpayer money to lease a luxury Lexus hybrid sedan. In November 2012, Hastings was a member of the host committee for “Leading with Love,” an event celebrating the fifth anniversary of the Marxist-led National Domestic Workers Alliance. At President Barack Obama’s State of the Union address in January 2016, Hastings brought Nezar Hamze, the CEO and Regional Operations Director of the Florida statewide chapter of the Hamas-linked Council on American-Islamic Relations (CAIR), as his special guest. During a February 2015 House committee meeting, Hastings stated that Texas’s refusal to join Obamacare’s exchanges proved that it was “a crazy state.” When Texas Republican Rep. Michael Burgess took exception to what he had said, Hastings refused to apologize. When the Daily Caller in February 2018 contacted Hastings and a number of his fellow Congressional Black Caucus members to ask if they would be willing to publicly denounce the notorious Nation of Islam leader Louis Farrakhan, Hastings was one of 20 who declined not only to denounce him, but also to issue any comment at all regarding his infamous anti-Semitic, anti-white rhetoric. Today Hastings is a member of the American Civil Liberties Union, the NAACP, and the National Organization for Women. For an overview of Hastings’ voting record on numerous key issues during his congressional career, click here. Further Reading: “Alcee Hastings” (Votesmart.org, Keywiki.org). The case involved two brothers, Frank and Thomas Romano, who had been convicted in 1980 on 21 counts of racketeering. Together with attorney William Borders Jr., Hastings, who presided over the Romanos’ case, hatched a plot to solicit a bribe from the brothers. In exchange for a $150,000 cash payment, Hastings would return some $845,000 of their $1.2 million in seized assets after they had served their three-year jail terms. Taped conversations between Hastings and Borders confirmed that the judge was a party to the plot. “Hastings Joins His Former Accusers” (Washington Post, 1-6-1993). “Leader of Foreign Election Monitors Under Federal Investigation” (American Policy Center, 8-30-2004). 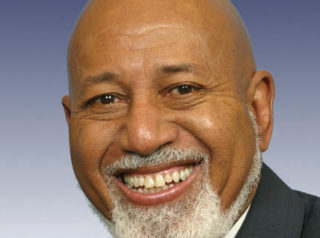 “House Extends Alcee Hastings Travel Probe” (SunshineStateNews.com, 11-16-2010). “Alcee Hastings’s Wage Disbursements” (5-2-2006); “Hastings’ Hire Needs Explaining” (Sun-Sentinel, 6-15-1993); “Alcee Hastings Ranks No.1 In Nepotism” (JudicialWatch.org, 3-27-2012); “Rep. Alcee Hastings Maxes Out Girlfriend’s Salary for Fifth Straight Year” (Washington Free Beacon, 3-8-2017). Concerning the latter, Hastings claimed that “President Bush unilaterally authorized a secret domestic spying program, illegally ignoring the Foreign Intelligence Surveillance Act (FISA) and the general public’s civil rights.” But in fact, the Bush administration had consulted with Democratic legislators before enacting the program, which did not violate FISA. “Hastings: American Secrets for Sale?” (by Andrew Walden, Front Page Magazine, 9-27-2006). “Hastings on Palin and Jews and Blacks” (Miami Herald, 9-24-2008). “About Alcee Hastings’ $24,730 Lexus lease” (Palm Beach Post, 6-1-2009). “Rep. Alcee Hastings Invokes Thomas Edison: ‘No Rules Around Here — We’re Trying to Accomplish Something’” (Palm Beach Post, 3-20-2010). “Congressman Alcee Hastings Sued for Sexual Harassment” (Breitbart.com, 3-8-2011). “Leaders of Designated Terrorist Group Invited to State Of The Union” (Front Page Magazine, 1-12-2016). “Is Texas ‘Crazy’ or Is It the Real America?” (by John Fund, National Review, 2-8-2015). “Exclusive: Taxpayers Paid $220K to Settle Case Involving Rep. Alcee Hastings” (Roll Call, 12-8-2017). “Dem Rep. Alcee Hastings Jokes About President Trump Drowning in the Potomac River” (Daily Caller, 8-19-2018).